Serenity Now: She Hung WHAT On Her Wall?! 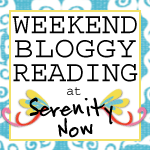 This is my first time participating in a blog party at Nester's fabulous Nesting Place blog. I'm a little intimidated because actual, like, designers read and link to her blog. So some silly "twenty-faux" year old housewife in Virginia is more likely to inspire snickers than appreciative smiles, but I'm okay with that. I don't have a degree in Interior Design, and it turns out that all the Chaucer I read in college doesn't exactly lend itself to choosing drapes. And yes, that is an actual musical instrument on my wall. a) I was only 22 when we bought this home (our first) and I had absolutely no clue what I liked. I think I subconsciously channeled my mother's style (gasp!!!!). My tastes have changed in the past years, but most of my rooms don't really reflect that change. I think it's too country for me now, and I'm hoping to update bit by bit. So please keep that in mind. b) I readily welcome your suggestions, just please don't be mean. I kind of cry easily. c) It's super-fantastic to have a husband who manages the Burg's oldest mattress store. They have fabulous lines of bedroom furniture, and he has accounts with all sorts of great companies that regular furniture stores do. (He also had the records on the store computer of all our purchases!) Unfortunately, I was very impatient in those early days of home ownership, and I used our discount to purchase some items that I don't think fit with my style any more just because I *had* to have something. Now I'm kind of stuck with it until I can buy/transform/create what I want. Even though we were able to use T's discount, it will end up costing us some more, because I didn't take the time to find out what my style is. It's amazing what a few years of life experience (and a few kids) will do to your taste. I am more patient now with my purchases! You can click on the image to enlarge, but I'll go ahead and list the numbers for you too. Along with the nasty forest green carpet and sticky tack that was ground into the walls when we moved into our 1970s Colonial, there was really no architectural detail to speak of in our house. It was T's idea to finish off the opening with the molding, and he did it all on his own. If you look at the main photo, you can see he framed the entire opening, and he did the same on the other side in the Dining room. Cost? Approximately $50 to $60 because we used leftover paint from the trim work. 2. 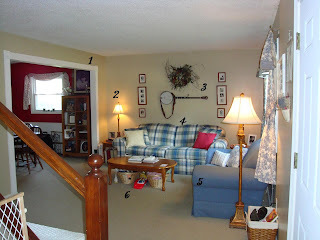 Matching lamps: Now that I know in my wisdom of reading blogs life experience that's okay to mix and match lamps in a room, I kind of cringe when I see my 4 matching lamps in the Family room. I ordered them through an account with T's store, and we have two small ones and two large floor lamps. I love the detail on the bases, but I really don't care for the finish. Judging from the current color scheme I have going on, I'm thinking that they should maybe be spray painted white, but what do I know? Let's discuss the elephant in the room, shall we? This banjo was hand-made by a craftsman in the mountains of Colorado in the 1970s. 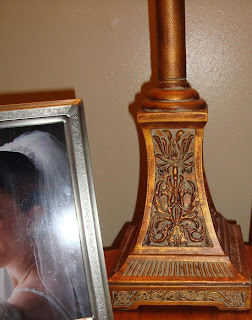 It has beautiful carvings, but they're hard to see because of the way I had T hang it. I like the details on the old leather belt that they used for a strap. An instrument like this runs several thousand dollars. It belonged to my dad, who received it as a college graduation gift from his parents. I think he was into the folk music movement in the 60s...Bob Dylan and the like. At any rate, after he passed away, the banjo just sat in my mom's basement for years. I don't play it, and I know it "countryfies" my room, but it's probably my most treasured accessory because it belonged to my dad and he loved it so much. In the years I've had it hanging on my wall, I've only had one "I can't believe you have a weird banjo on your wall" comment. It's surrounded by copies of old family photos from dad's side of the family. I LOVE family photos! This was another freebie, and a good thing for us. I know how expensive nice couches are! My mom gave it to us as an anniversary gift one year. If I had a do-over, I'd chose something neutral, but it is fairly kid friendly, and very comfortable. I actually love the comfiness of this chair, but again, I'd choose a neutral color if I had a choice today. T gave it to me as a Mother's Day gift one year, and I believe he paid around $300. It came with an enormous matching ottoman that sits in the addition. He was surprised to find it in the clearance section of a local furniture shop. It's not the greatest quality (hence the clearance section), but I love to sit and read there or catch up with my friend TiVo. 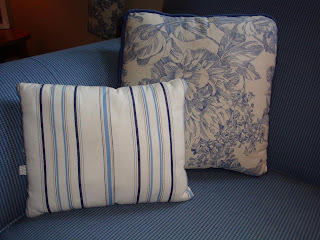 I was able to match some existing pillows with the chair. You may recognize the Waverly blue from Target. It's more than several years old. The little pillow was actually a steal from Target's Dollar Spot. I think I paid $2.50. The large pillow was probably about $15.00. And because I had no idea what I was doing, I chose the valance and curtains that match the pillow. (Below) I loved them so much at the time that I also put them in the Kitchen. And our bedroom. I hate them, loathe them, despise them now. You would too if that's all you had to look at. I desperately need to break down and try some of Nester's mistreatment therapy! 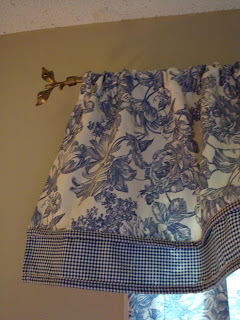 And because I can laugh at myself, I can also make mention of the odd curtain rod. What was I thinking?! I'd estimate that I spent about $45.00 on the window treatments, and $30.00 on the rod. Little gate on the wall. I sorta like this...maybe painted white? Same with the dried flower holder? Gate was $3.00 at a little boutiquey shop some years ago, and the flower arrangement was around $4.00 at an old farmhouse home show. The tables make me want to bang my head against the oak and yell, "Why? Why?" Let my Family room be a testament to you young new homeowners (SuSu! Alison!) 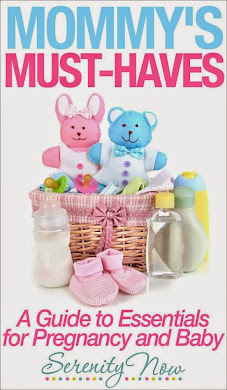 that not everything has to match, and it's okay not buy the first thing you find just so you can have something, anything to take up the blank space. It is okay to shop thrift stores! I wish someone had told my 22 year old self that! 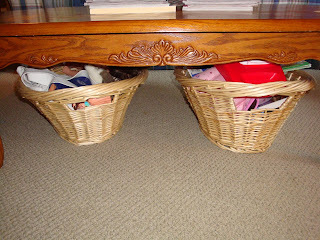 The baskets were around $2.oo each, and I'd like to spray paint them as well. Because stupid me didn't envision the future with children, I didn't choose tables with storage options. So the baskets are my solution to that area. I really do love this piece. 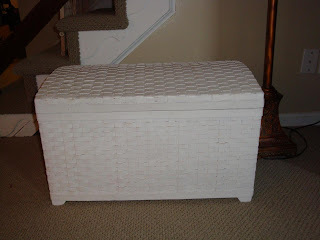 The inside is lined with beachy inspired fabric, and it has tons of room in there for storage! Cost? I got it on clearance at Target for $30.00. 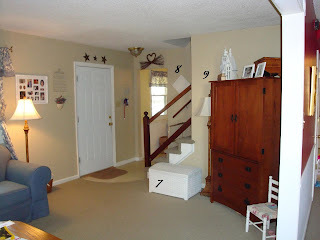 I'm including this area because there is no real dividing point between our entry and the Family room. I paid around $5.oo for each of the tin ceiling tiles, and the white frames are all various 40% coupon purchases from Michaels, filled with family photos. I'd estimate this spot to cost around $45.00. This guy is pretty tall and solid. 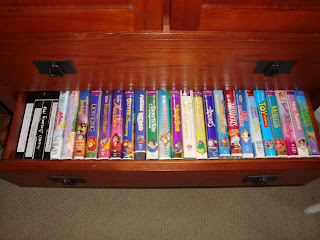 It houses our TV and I use the drawers to organize the girls' VHS movie collection (can you say yard sale?!). Watching a movie is a special treat for Natalie. I'm a bad mother for using TV as a reward I guess. Eh. I really like the items I have on top of the armoire, but I'm not certain they all belong up there. 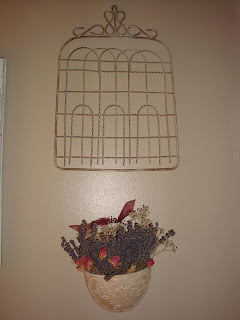 The birdcage cost me $2.00, including the spray paint I bought to cover it with. The books were from the FREE box at Salvation Army! 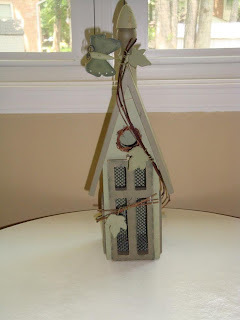 This is what the birdhouse looked like before it had a date with my spray paint. I had forgotten all about it up in the attic, but the birdcage sparked my memory. This is what I've got hanging on on the other side of the armoire. The tiny wooden trunk was a Christmas gift from my dad one year. I have all sorts of old mementos inside. I keep it up there because it is out of reach for sticky-fingered toddlers and preschoolers, and it doesn't really go anywhere else because it would just take up space on the floor. I love the picture frames! 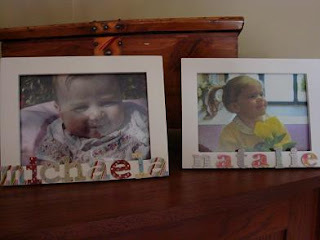 The one that says "Natalie" was a gift from my friend L. I tried to copy her version to make one for Michaela Byrd, but L used actual chipboard and a nice quality frame. My letters are paper and they are glued up there. Probably cost me $4.00 for that project. I hope you enjoyed my tour! Were you close in guessing my prices? It might not be perfect (yet), but it's home to us! Love the banjo, Amanda! Especially because of the story behind it. Also like how you hung family photos on either side of it. I am all about the banjo and gate on the wall. I used to hang my flute on the wall with wire and by golly, I'm gonna dig it out and hang it up again--thanks for the inspiration! I love the banjo, too, and you should not be so self-conscious about it! It's a great family heirloom and story. Be proud it's on the wall! What great spaces! Love the banjo on the wall -- unique things are the best and the price is PERFECT! I also love that trunk from Target. I also think the banjo is great, your home should be decorated with items that are special, and that sure is! I like how you kept wondering if you should paint things white, maybe you're drawn to a lighter decor? Try it! Those lamps would be fabulous painted white, and the gate too! Have fun. Amanda I love your banjo on the wall, and what a lovely testament to your dad! I don't know if you noticed but the fretwork inlays on the banjo very nearly match the design on the lamp bases, so I think you're onto something with those. I would TOTALLY paint those lamp bases white! You are so funny! You have some great pieces. And I am all about hanging sentimental stuff on the wall. As for spray paint, it covers a multitude of sins. I can't live without it. You have a darling house. Very cozy. P.S. I think your lamps are great and they'd be awesome painted white. Go for it! Hon, you're young and don't you beat up on yourself! When you get to be my age, which is 52, and I have daughters nearly 31 & 35, you look back on the days when you were young and remember how you beat up on yourself. And then you ask yourself: Well, how on earth did I think I was going to learn if I didn't make mistakes so I knew? You've done a great job, and you got great discounts. At my age I'm still learning, and when you stop learning you're dead! This is my first time with The Nester, so I'm scared too. We'll just be scared together! You're doing great. You're putting love in the rooms of your home with every thing you place there. That's what counts! Oh yeah, and I love that banjo! Gives the room real character with memories attached! I love the detail you put on your molding. Looks great! I'm so proud of you for joining this fun party my dear! The banjo is absolutely my favorite....it kinda reminds me of listening to some of my relatives talk! Don't trip girl! Your home should be where YOU are happy and comfortable. Thats it. 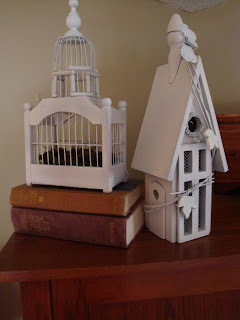 I love the white bird cages, and props to you for reinventing them with some spray paint. Thanks for visiting my Beach Guest Room! It looks like you have been busy scouting some big sales! I really like the painted birdcages. Lovely. I love the banjo, too.....and guess what? I have the same little gate, but I put a basket of greenery, similar to your basket, but it's hung on TOP of the gate....I'll have to see if I can find a pic of it. You might like to move the planter up and change to feathers or greenery or something fun. I think you will, over time, find what you like and feel more comfortable with it. I am past forty (ahem) and am really just finally replacing some early marriage pieces and finding things that more fit my style now....so don't beat yourself up about that. I have a friend who used to say "some people have nice things, and some people have KIDS..."
Hello! You are being too hard on yourself. 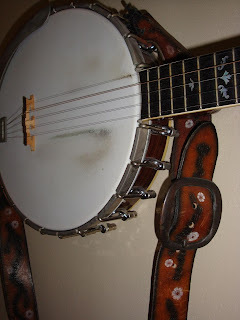 That banjo is fabulous - it has a wonderful story and reminds you of your dad. Decor like that makes a house a home! I really like the gate, too - great find! Some of the things that aren't your favorites can be transformed with a little creativity and paint. My den is a testament to that - ha! I'm thirty something and still building my style! I think you are off to a great start! Thanks for sharing! Loved the post. It was a great peek into your home and life. A few things that struck me...first of all the title (She hung WHAT on the wall? ), it definitely caught my eye! And yes, the banjo. I think its great, but the strap is what gets me. I think it adds funny lines to the space. I'm wondering if there might be a way to keep it in the space but used in a different way? Hmm, just a thought. Don't have any suggestions, but I just might consider removing the strap. I love your armoire. We use ours to house the gazillion movies as well. And the white trunk. LOVE IT! As for the lamps, the baskets, the coffee tables, gate, etc. Spray paint, spray paint, spray paint. I think they would all look great in a distressed white look. Still a little country, but also a little chic too. I actually don't mind the matchy matchy with the curtains and the pillows. I think the material is a classic pattern. I might paint the rod a different color (black, white? ), or perhaps look into getting some different finials (cheap way to totally change the look). Overall, your room really is great. There is so much potential. You have done some really great things with it, and like any room in any of our houses, there is always more that we can add to it. And nice bargain hunting! I wish I had the mattress/bedroom furniture hook up! I LOVE the banjo!! I would build an entire room around that one piece. You should look into buying a wall mount for hanging guitars and such on to hang it. If you live near a Guitar Center, they sell many varieties that swivel or that you can hang at an angle or just one that hangs straight down. Between my husband and I, we have 4 guitars and bass. At one point they were all hanging in a row on a wall and we got many compliments on it. In addition, or instead of you could find a large frame to hang up around it. I just found a huge picture frame at a garage sale - it didn't have any glass or backing or anything, so it was only 3 dollars. That would be perfect to frame your banjo and make it look more legit as wall art. And I totally know what you mean about not knowing your style when you first get married I've been married nearly 7 years and I am finally discovering my style. I'm having so much fun shopping at garage sales and thrift stores and finding perfect pieces for my style. It's such a cheap way to go. Plus, the little city I live in has a great freecycle group and I've gotten a few pieces of furniture from other people who haven't wanted them and have been able to paint or slip-cover them to perfection! I have so much more fun decorating my house now that I know what I love! Please check out my blog if you have a minute. 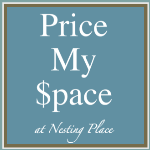 I enjoyed seeing your space! Good for you for (now) being willing to go slowly & find things you love! My home is a work-in-progress too...I just don't have that decorator gene, so I'm S L O W at anything decorating related! thanks for sharing! I also love the banjo, the box from your Dad, and the bird houses. Your curtains are great... I'm sorry you don't like them. They are very classic. Maybe you could Nesterize them to make them a litte different in each room (fringe, etc.) Thanks for sharing. You have a great space! Seriously, every single person here goes through decorating style phases. As we grow and change through the seasons of life, it's only natural that we want our environment to reflect that! I have changed my "look" several times! I think that your room is beautiful, and if you really want to change anything, just a couple of accessory changes would make a big impact! I love the family photos and banjo, they're so great!! 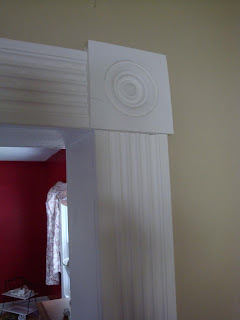 And the molding is wonderful too!! Thanks for sharing :)! I love the banjo! In our house we have a guitar and a mandolin that are in semi-constant danger from a 15 month old... I would love to hang them on the wall in our office. I will have to try to figure out how to do that... what did you use? But don't be hard on yourself! Your living room looks comfortable and welcoming, and THAT is so much more important than having it be "just so"! Hey there! Your posts always crack me up. You're just so darn funny. I think your room looks very warm, comfortable and inviting. You've done a great job! I'm laughing at the whole "buying it all at 22" thing. I'm pretty sure I did the same thing...ahhh, live and learn :-). I think your family room looks so warm and comfy! And I love that you have a story behind everything in there...especially the banjo. And hey, at 22 I think I was still using milk crates and futons as furniture, so you're ahead of the game, girl! I adore the banjo on the wall! It gives the room real character and the story behind it makes it just that much better!!! I like the lamps too. I think they are very pretty the way they are, however if you wanted to paint them white they would look Shabby Chic"ish" and good too. Black paint on one may look good too. After you find more lamps, maybe try moving one or two of them to different rooms (maybe a bathroom vanity, kitchen counter, or on bedside tables) so that you don't notice any "matchy-matchy". You don't give that coffee table enough credit... go get yourself some liquid sandpaper, get that finish off and paint that sucker white! You will be amazed. It has great bones. ;) Oh, and how can I forget the molding... it looks FANTASTIC! The banjo is great! And you've gotten lots of great suggestions for different ways to display it going forward - but I'd say it absolutely has to stay! Have you ever considered propping it on top of your armoire? My overall impression is that you have lots of elements that would work with cottage-style decor. 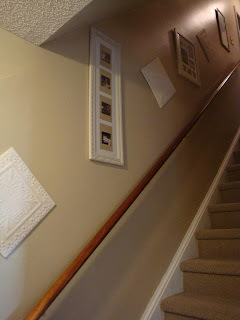 Check out http://abeachcottage.typepad.com/ - she paints almost EVERYTHING white. If I had your stuff, I'd think about adding a little more red and some black to ground things. Your big foundation pieces will serve you well as your taste evolves - even the matching lamps! Hey, everybody gets tired of what they have after a while. You just see what you can do with it. You could spray paint lamps, curtain rod and coffee table white and distress them a little. I noticed that your dining room is red and you have a red pillow on the couch. You could add a few more red touches and some barn stars for an Americana theme. The banjo would fit in with that (love it, BTW). Change you window treatments to white sheers or maybe something with red (ticking stripe?) if you were going that direction. Alternatively you could try slipcovering your furniture. it looks so cozy! very cute! I sooo know what you mean about your taste, and style changing. I'm like you...don't have my home looking like I want, and am having to gradully transform it as time and finances allow. But hey...at least your house is clean! I love the banjo! And I think the lamps would look beautiful painted black...but it sounds like you're going for a more "light" look with the white's and neutrals. I'm in a brown/tan/black phase right now! Hello Amanda - love that banjo! My grampa played one and I used to love to sit and listen to him. What a great way to display it! I really like the molding around the dining room entry. 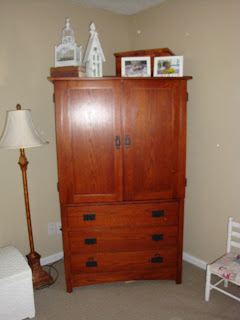 And that armoire is beautiful! Love the lamps - they would look neat painted creamy white and distressed. Thank you for sharing! I love the banjo on the wall!! I am also amazed at how my tastes have changed, and how now I would rather be creative and not spend very much money and how newly married twenty-something me just wanted stuff!!! !